The deuterium isotope's name is formed from the Greek deuteros, meaning "second", to denote the two particles composing the nucleus. Deuterium was discovered and named in 1931 by Harold Urey. When the neutron was discovered in 1932, this made the nuclear structure of deuterium obvious, and Urey won the Nobel Prize in 1934 “for his discovery of heavy hydrogen”. Soon after deuterium's discovery, Urey and others produced samples of "heavy water" in which the deuterium content had been highly concentrated. Deuterium is destroyed in the interiors of stars faster than it is produced. Other natural processes are thought to produce only an insignificant amount of deuterium. Nearly all deuterium found in nature was produced in the Big Bang 13.8 billion years ago, as the basic or primordial ratio of hydrogen-1 to deuterium (about 26 atoms of deuterium per million hydrogen atoms) has its origin from that time. This is the ratio found in the gas giant planets, such as Jupiter. However, other astronomical bodies are found to have different ratios of deuterium to hydrogen-1. This is thought to be a result of natural isotope separation processes that occur from solar heating of ices in comets. Like the water cycle in Earth's weather, such heating processes may enrich deuterium with respect to protium. The analysis of deuterium/protium ratios in comets found results very similar to the mean ratio in Earth's oceans (156 atoms of deuterium per million hydrogens). This reinforces theories that much of Earth's ocean water is of cometary origin. The deuterium/protium ratio of the comet 67P/Churyumov-Gerasimenko, as measured by the Rosetta space probe, is about three times that of earth water. This figure is the highest yet measured in a comet. The existence of deuterium at a low but constant primordial fraction in all hydrogen is another one of the arguments in favor of the Big Bang theory over the Steady State theory of the universe. 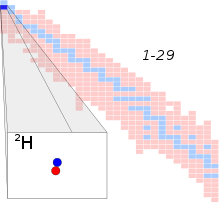 The observed ratios of hydrogen to helium to deuterium in the universe are difficult to explain except with a Big Bang model. It is estimated that the abundances of deuterium have not evolved significantly since their production about 13.8 billion years ago. Measurements of Milky Way galactic deuterium from ultraviolet spectral analysis show a ratio of as much as 23 atoms of deuterium per million hydrogen atoms in undisturbed gas clouds, which is only 15% below the WMAP estimated primordial ratio of about 27 atoms per million from the Big Bang. This has been interpreted to mean that less deuterium has been destroyed in star formation in our galaxy than expected, or perhaps deuterium has been replenished by a large in-fall of primordial hydrogen from outside the galaxy. In space a few hundred light years from the Sun, deuterium abundance is only 15 atoms per million, but this value is presumably influenced by differential adsorption of deuterium onto carbon dust grains in interstellar space. Cometary bodies such as Comet Hale-Bopp and Halley's Comet have been measured to contain relatively more deuterium (about 200 atoms D per million hydrogens), ratios which are enriched with respect to the presumed protosolar nebula ratio, probably due to heating, and which are similar to the ratios found in Earth seawater. The recent measurement of deuterium amounts of 161 atoms D per million hydrogen in Comet 103P/Hartley (a former Kuiper belt object), a ratio almost exactly that in Earth's oceans, emphasizes the theory that Earth's surface water may be largely comet-derived. Most recently the deuterium/protium (D/H) ratio of 67P/Churyumov–Gerasimenko as measured by Rosetta is about three times that of Earth water, a figure that is high. This has caused renewed interest in suggestions that Earth's water may be partly of asteroidal origin. After World War II ended, the Allies discovered that Germany was not putting as much serious effort into the program as had been previously thought. They had been unable to sustain a chain reaction. The Germans had completed only a small, partly built experimental reactor (which had been hidden away). By the end of the war, the Germans did not even have a fifth of the amount of heavy water needed to run the reactor,[clarification needed] partially due to the Norwegian heavy water sabotage operation. However, even had the Germans succeeded in getting a reactor operational (as the U.S. did with a graphite reactor in late 1942), they would still have been at least several years away from development of an atomic bomb with maximal effort. The engineering process, even with maximal effort and funding, required about two and a half years (from first critical reactor to bomb) in both the U.S. and U.S.S.R., for example. ^ a b c d O'Leary, Dan (2012). "The deeds to deuterium". Nature Chemistry. 4 (3): 236. Bibcode:2012NatCh...4..236O. doi:10.1038/nchem.1273. PMID 22354440. ^ a b c Hartogh, Paul; Lis, Dariusz C.; Bockelée-Morvan, Dominique; De Val-Borro, Miguel; Biver, Nicolas; Küppers, Michael; Emprechtinger, Martin; Bergin, Edwin A.; et al. (2011). "Ocean-like water in the Jupiter-family comet 103P/Hartley 2". Nature. 478 (7368): 218–220. Bibcode:2011Natur.478..218H. doi:10.1038/nature10519. PMID 21976024. ^ "§ IR-3.3.2 Provisional Recommendations". Nomenclature of Inorganic Chemistry. Chemical Nomenclature and Structure Representation Division, IUPAC. Archived from the original on 27 October 2006. Retrieved 3 October 2007. ^ Weiss, Achim. "Equilibrium and change: The physics behind Big Bang Nucleosynthesis". Einstein Online. Retrieved 2007-02-24. ^ IUPAC Commission on Nomenclature of Inorganic Chemistry (2001). "Names for Muonium and Hydrogen Atoms and their Ions" (PDF). Pure and Applied Chemistry. 73 (2): 377–380. doi:10.1351/pac200173020377. ^ "Cosmic Detectives". The European Space Agency (ESA). 2 April 2013. Retrieved 2013-04-15. ^ graph of deuterium with distance in our galactic neighborhood Archived 5 December 2013 at the Wayback Machine See also Linsky, J. L.; Draine, B. T.; Moos, H. W.; Jenkins, E. B.; Wood, B. E.; Oliviera, C.; Blair, W. P.; Friedman, S. D.; Knauth, D.; Lehner, N.; Redfield, S.; Shull, J. M.; Sonneborn, G.; Williger, G. M. (2006). "What is the Total Deuterium Abundance in the Local Galactic Disk?". The Astrophysical Journal. 647 (2): 1106–1124. arXiv:astro-ph/0608308. Bibcode:2006ApJ...647.1106L. doi:10.1086/505556. ^ Lellouch, E; Bézard, B.; Fouchet, T.; Feuchtgruber, H.; Encrenaz, T.; De Graauw, T. (2001). "The deuterium abundance in Jupiter and Saturn from ISO-SWS observations" (PDF). Astronomy & Astrophysics. 670 (2): 610–622. Bibcode:2001A&A...370..610L. doi:10.1051/0004-6361:20010259. ^ Halford, Bethany (4 July 2016). "The deuterium switcheroo". Chemical & Engineering News. American Chemical Society. pp. 32–36. ^ Kushner, D.J. ; Baker, A.; Dunstall, T.G. (1999). "Pharmacological uses and perspectives of heavy water and deuterated compounds". Can. J. Physiol. Pharmacol. 77 (2): 79–88. doi:10.1139/cjpp-77-2-79. PMID 10535697. ^ Vertes, Attila, ed. (2003). "Physiological effect of heavy water". Elements and isotopes: formation, transformation, distribution. Dordrecht: Kluwer. pp. 111–112. ISBN 978-1-4020-1314-0. ^ Neutron-Proton Scattering. (PDF). mit.edu. Retrieved on 2011-11-23. ^ deuteron mass in u. Physics.nist.gov. Retrieved on 2016-01-07. ^ deuteron rms charge radius. Physics.nist.gov. Retrieved on 2016-01-07. ^ Pohl, Randolf; Nez, François; Fernandes, Luis M.P. ; et al. (The CREMA Collaboration) (12 August 2016). "Laser spectroscopy of muonic deuterium". Science. 353 (6300): 669–673. Bibcode:2016Sci...353..669P. doi:10.1126/science.aaf2468. hdl:10316/80061. PMID 27516595. ^ Yirka, Bob (12 August 2016). "New measurement with deuterium nucleus confirms proton radius puzzle is real". Phys.org. ^ Seelig, J. (1971). "Flexibility of hydrocarbon chains in lipid bilayers". J. Am. Chem. Soc. 93 (20): 5017–5022. doi:10.1021/ja00749a006. PMID 4332660. ^ "Oxygen – Isotopes and Hydrology". SAHRA. Archived from the original on 2 January 2007. Retrieved 2007-09-10. ^ West, Jason B. (2009). Isoscapes: Understanding movement, pattern, and process on Earth through isotope mapping. Springer. ^ Hobson, K.A. ; Van Wilgenburg, S.L. ; Wassenaar, L.I. ; Larson, K. (2012). "Linking Hydrogen (δ2H) Isotopes in Feathers and Precipitation: Sources of Variance and Consequences for Assignment to Isoscapes". PLOS ONE. 7 (4): e35137. Bibcode:2012PLoSO...735137H. doi:10.1371/journal.pone.0035137. PMC 3324428. PMID 22509393. ^ "NMI3 – Deuteration". NMI3. Retrieved 2012-01-23. ^ Sanderson K (March 2009). "Big interest in heavy drugs". Nature. 458 (7236): 269. doi:10.1038/458269a. PMID 19295573. ^ Katsnelson, A (June 2013). "Heavy drugs draw heavy interest from pharma backers". Nature Medicine. 19 (6): 656. doi:10.1038/nm0613-656. PMID 23744136. ^ Gant, TG (May 2014). "Using deuterium in drug discovery: leaving the label in the drug". Journal of Medicinal Chemistry. 57 (9): 3595–3611. doi:10.1021/jm4007998. PMID 24294889. ^ Schmidt, Charles (10 July 2017). "First deuterated drug approved". Nature Biotechnology. 35 (6): 493–494. doi:10.1038/nbt0617-493. PMID 28591114. ^ Halliwell, Barry; Gutteridge, John M.C. (2015). Free Radical Biology and Medicine (5th ed.). Oxford: Clarendon Press. ISBN 9780198717485. ^ Schmidt, C. (2017) First deuterated drug approved. Nature Biotechnol. 35, 493–494. ^ Brickwedde, Ferdinand G. (1982). 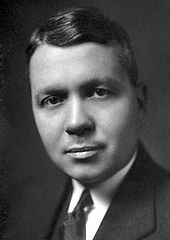 "Harold Urey and the discovery of deuterium". Physics Today. 35 (9): 34. Bibcode:1982PhT....35i..34B. doi:10.1063/1.2915259. ^ Urey, Harold; Brickwedde, F.; Murphy, G. (1932). "A Hydrogen Isotope of Mass 2". Physical Review. 39 (1): 164–165. Bibcode:1932PhRv...39..164U. doi:10.1103/PhysRev.39.164. ^ "Science: Deuterium v. Diplogen". Time. 19 February 1934. ^ Sherriff, Lucy (1 June 2007). "Royal Society unearths top secret nuclear research". The Register. Situation Publishing Ltd. Retrieved 2007-06-03. ^ "The Battle for Heavy Water Three physicists' heroic exploits". CERN Bulletin. European Organization for Nuclear Research. 25 March 2002. Retrieved 2015-11-02. ^ Chang, Kenneth (16 August 2018). "Settling Arguments About Hydrogen With 168 Giant Lasers". The New York Times. Retrieved 18 August 2018. ^ "Under pressure, hydrogen offers a reflection of giant planet interiors". Carnegie Institution for Science. 15 August 2018. Retrieved 19 August 2018. ^ Massam, T; Muller, Th. ; Righini, B.; Schneegans, M.; Zichichi, A. (1965). "Experimental observation of antideuteron production". Il Nuovo Cimento. 39 (1): 10–14. Bibcode:1965NCimS..39...10M. doi:10.1007/BF02814251. ^ Dorfan, D. E; Eades, J.; Lederman, L. M.; Lee, W.; Ting, C. C. (June 1965). "Observation of Antideuterons". Phys. Rev. Lett. 14 (24): 1003–1006. Bibcode:1965PhRvL..14.1003D. doi:10.1103/PhysRevLett.14.1003. ^ Chardonnet, P.; Orloff, Jean; Salati, Pierre (1997). "The production of anti-matter in our galaxy". Physics Letters B. 409 (1–4): 313–320. arXiv:astro-ph/9705110. Bibcode:1997PhLB..409..313C. doi:10.1016/S0370-2693(97)00870-8. This page was last edited on 16 April 2019, at 08:30 (UTC).